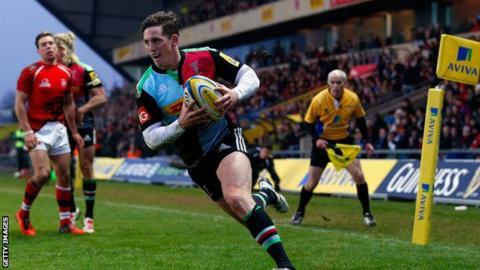 Harlequins winger Tom Williams will retire from playing at the end of the season and join the club's academy coaching staff. The 31-year-old has scored 65 tries in 214 appearances since making his senior debut for Quins in 2004. Williams served a four-month ban in 2009 for his part in the 'Bloodgate' scandal at Harlequins. "It is with a heavy heart that I have to announce that my playing time with Harlequins is over," he said. "From my debut until my last game I can't express the excitement and pride I have felt every time I have pulled on the Harlequins jersey. "Time and injury have caught up with me over the last two years and while I may have one or two regrets, I can look back on my career with Harlequins with immense pride." Williams, a one-club man who has been at the Twickenham Stoop for 13 years, helped Quins to win the European Challenge Cup, the Premiership title and the LV= Cup in the three seasons from 2011 to 2013. The Brighton-born player has made just four appearances for Harlequins this season, with two of those coming in the Premiership. Williams' spell at Harlequins was tainted by his involvement in the infamous 'Bloodgate' scandal in the 2008-09 season. The winger faked a blood injury in a Heineken Cup game against Leinster, allowing Nick Evans to return to the field, and later had his lip cut in an attempt to make the injury appear genuine. Then-head coach Dean Richards left the club and was handed a three-year ban while Williams was given a 12-month ban which was later reduced. Quins director of rugby Conor O'Shea said Williams had "one of the best rugby brains" in the professional game. "Tom is remaining proof that rugby doesn't have to be about size," he said. "His ability to know where to stand in defence and his lines of running in attack remain an on pitch rugby education to anyone. "He has given some great memories to this club over an incredible career. "He will be missed as a player but I know with his rugby intellect a fabulous coaching career awaits."